Workplace Safety Training Materials are designed for encouraging a safe work environment. Confidently teach employees how to create a safety committee, identify and resolve hazards, incident management and more! 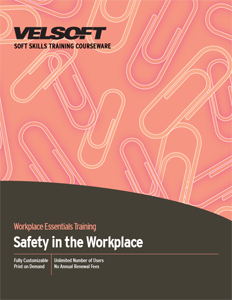 Seeing is Believing This sample manual to teach Safety in the Workplace is in MS Word format. Workplace accidents and injuries cost corporations millions of dollars and thousands of hours lost every year. They also have a profound, often lifelong impact on workers. Introducing a safety culture into the organization, where workplace safety is valued as an integral part of the business' operation, not only saves the business time and money, it also builds a committed, loyal, healthy workforce. Safety in the Workplace Training Materials is a one-day workshop, and will give employees the foundation to start building their safety culture. Understand the basics of accident investigation and documentation.